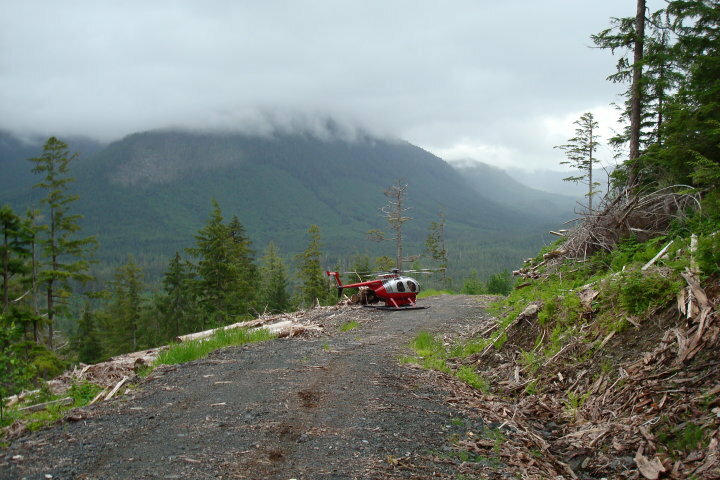 Above: MD500 on a logging road pickup spot on Prince of Wales, 2010. It’s safe to say that the job I had in Alaska was hands down one of the best jobs to have in the Forest Service if you’re an aviation person. I can say it’s a job that I enjoyed immensely most of the time, and it was probably the best job I’ve had so far in my career. I was pretty much my own boss, I got to fly around in some of the most amazing country on the face of the earth, and I met some incredible characters while I was at it. I spent a majority of my first summer working on the northeastern end of Prince of Wales Island (called PoW by some locals), flying timber marking crews up to the ridgetops above Coffman Cove to lay out a timber sale. In between those flights, we would fly wildlife biologists, soils specialists, hydrologists, and other various -ologists to an adjacent project that was being evaluated for a different timber sale. The Forest Service had put a floating bunkhouse at Coffman Cove, and that’s where we stayed when we were out there. But I’m getting ahead of myself a bit. Coffman Cove is a small community on the northeastern coast of Prince of Wales Island, with maybe 200 residents in the general area. Wildlife was abundant, with black bears wandering the area, eagles and ravens nesting along the shores of the cove, and whales, salmon, and halibut in the deeps just offshore. Amenities were not abundant. A small general store with as much fishing gear as grocery items, a two-room library with an espresso machine that was open for a few hours a day, a liquor store with some cheap beer and a lot of hard alcohol, and that was about it. The community was on the road system, but it was at least an hour drive to the next community, and electricity was generated on site by a massive diesel generator. Several of the local air taxi services flew in and out of town daily, to the state-built floatplane dock in the cove, and as fishing season ramped up there was a fair amount of boat traffic in and out at all hours, dropping off salmon on ice to be trucked to Thorne Bay and the packing plants in Ketchikan. There was no cell service, no internet, and the only phone I had access to was a community line at the abandoned ferry terminal, which had been repurposed as a kind of community hall. Originally set up to provide ferry service between Ketchikan, Coffman Cove, Wrangell, and Petersburg, it only operated for a few years before shutting down. In the summer of 2010, the Forest Service rented space at the dock to place a floating bunkhouse for the field crews. 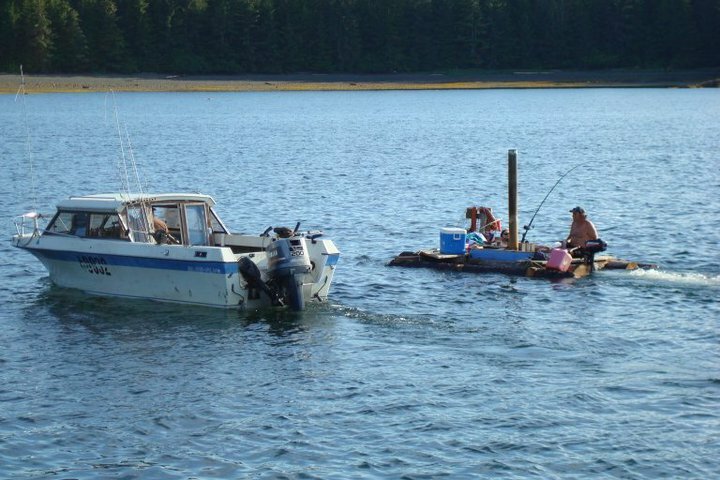 The Tongass has several floating bunkhouses, or barges, that they move around the forest based on where the field work will need it. They are almost entirely self-sufficient, with a diesel generator, solar panels, and batteries for power, large potable water tanks, and a grey water system, and enough room for 10 or 12 people to live comfortably. In 2010, the Forest Service also contracted with some of the locals to cook for the field crews during the week, and we had some great food while we were there. There’s nothing quite like getting done with a long day in the field and walking into the barge to the smell of authentic Italian cacciatore made by a professional chef who came to PoW to get away from it all. 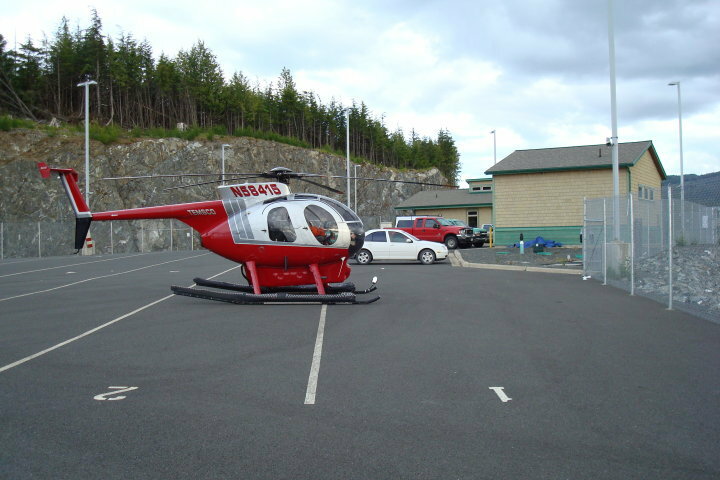 Above: Helicopter 415 at the parking lot in Coffman Cove, 2010. A typical day at Coffman started early and ran until about 6pm. For the helicopter side of things it was just me and the pilot, Tim. We’d try to have a plan the night before, and start the day a little before 7am, getting gear loaded, the helicopter preflighted, and ready to turn rotors when dispatch opened up at around a quarter after 7am. For us it was a short commute to work – we parked the helicopter next to the barge in the empty parking lot of the ferry terminal. On busy days we’d have around thirty people to move, two at time, from a pickup spot on a road system to their work sites on the mountainside, and back again at the end of the day. For the main timber project we established a pickup site at an old fill dirt dump site just outside of Coffman, which I’m pretty sure was filled with dirt contaminated with some sort of chemical that had been moved from the old lumber mill in town. It may have been a low-grade environmental hazard, but it was built like a small runway, and made an excellent spot for helicopter takeoffs and landings. We’d spend the morning bouncing around the area, picking up crews and moving them to landing spots on beaches, muskegs, and mountain meadows. Some days we’d have missions scheduled in the mid-afternoon, and we’d run to Ketchikan, Wrangell, Petersburg, or even north to False Island near Sitka to move a few recreation folks around, or to sling building materials from a trailhead to a cabin on a lake. Around 3 or 4pm we’d start the loop again, picking people up on the hillsides and flying them back to the roads two at a time. On a busy day I might spend 6 or 7 hours in the helicopter, and climb in and out of the front seat sixty or seventy times, and move a total of thirty or forty passengers and a few hundred pounds of daypacks, tree paint, and other gear. On good days the sun would be shining, everyone would be on time, and Tim and I would have some down time in the mid-afternoon to relax and have lunch at the barge or some scenic landing spot while we waited for the afternoon pickups. On normal days it was cloudy, rainy, windy, people were late, and we often had to eat lunch on the go, Tim sitting in the cockpit while I loaded and unloaded people and gear, and me while he refueled inbetween trips. On bad days we had to cancel flights because of low clouds and stormy weather, and we’d wait patiently on the barge, watching the weather to see if we could fly. I spent a lot of time watching cloud-enshrouded mountains drift in and out of view as the wind beat the sea against the rocks at the entrance to the cove. On those days I did a lot of reading, and gradually learned about the weather patterns in Southeast. As interesting as the day-to-day work was, my strongest memories from Coffman Cove and Prince of Wales are not specifically work related. Three things in particular stand out among the multitude of of good memories. Toward the end of the summer, the community had a potluck party to celebrate the completion of the first paved road to Coffman Cove. It was quite the event, to be able to drive on pavement all the way to Craig and Thorne Bay, and to kick it off there was a smorgasbord of fresh-caught, home-cooked seafood like I’d never seen before. Fresh halibut grilled and fried, smoked salmon, grilled salmon, shrimp the size of small lobsters, oysters grown a few miles away, and more crab than could be consumed in one sitting. Plus cold beer in several varieties… it was a feast of epic proportions. Because we had been flying in and out all summer, and the shindig was being held at the ferry terminal, we of course had to partake of the bounty, and it was good. It was one of those “only in Southeast” moments – where else could there be a seafood potluck to commemorate getting a paved road to your town? Also toward the end of the summer, as Tim and I were heading to the store to buy some adult beverages after busy day of flying around in the sunshine, we ran into some locals on the porch. In the middle of a conversation, one of the guys asked me if the Forest Service was out looking for what he thought we were looking for. I of course had no idea what he was talking about, but he had a twinkle in his eye, so I played along, and said “maybe.” He said something along the lines of “well, you probably wouldn’t tell me even if you were, would you!” I replied “nope, but it’s interesting all the things you see flying around out there” and winked at him. I later found out that the cast of the Animal Planet TV show “Finding Bigfoot” had been flying around the central part of PoW, in helicopters that looked just like ours, filming an episode of the show and looking for signs of Sasquatches. I can only guess how serious he thought I was, but it still makes me smile to think that maybe I contributed to a rumor that the Forest Service was spending taxpayer money looking for Bigfoot in Coffman Cove, Alaska. Above: Locals on the water in Coffman Cove, Alaska, 2010. This entry was posted in Alaska, Personal, Wild Places. Bookmark the permalink.